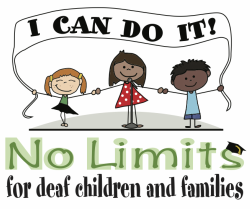 No Limits produces original plays specifically written for deaf and hard of hearing children who are learning to speak and listen. Through theater workshops and professional stage productions, children gain the skills and confidence needed to succeed in school, interact with their peers, and express themselves in their daily lives. Thanks to the loyal and generous support of the Adi and Jerry Greenberg Foundation, every year, No Limits produces a number of productions across the country. Do you want to bring No Limits to your community? You give us the heart and we'll give you the show! No Limits Theater Rental Kits contain everything you need to put on a successful production featuring children from YOUR community. Each kit provides a step-by-step guide, original script, music, costumes, sets, props, printed materials, programs, and much more. Over 100 shows have been produced in the following 13 states: New York, Oregon, Washington D.C., New Jersey, Minnesota, Pennsylvania, Connecticut, Illinois, Michigan, Indiana, Texas, Nevada, California, bringing the total number of audience members to over 200,000! To receive more information about the Theater Rental Kit, please call 310.280.0878 or email michelle@nolimitsfordeafchildren.org.